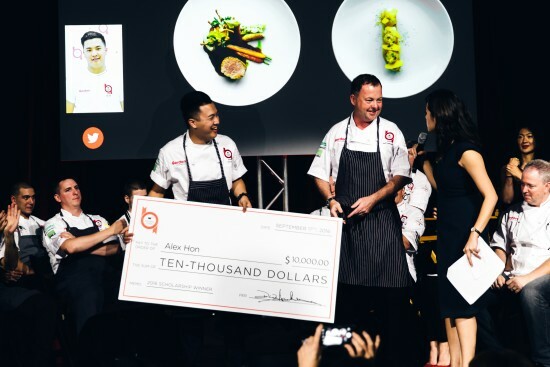 The Hawksworth Young Chef Scholarship Foundation is thrilled to announce Alex Hon of Vancouver’s West Restaurant as winner of the Foundation’s 2016 culinary arts competition – taking home $10,000 and winning a stage at an international restaurant. Established in 2013, the Foundation brings to life the scholarship’s vision of inspiring and encouraging young chefs from across Canada by giving them the opportunity to cook in front of a panel of the country’s most revered chefs and food critics. Alex Hon (25) from West wowed the judges with his dishes of carrot butter poached veal tenderloin with celery Dungeness crab, and almond cake with fresh mango and lemongrass crème légère, which were made using ‘black box’ ingredients of veal tenderloin, whole Dungeness crab, carrots, shishito pepper, mango and lemongrass. Hon showed incredible attention to detail in the kitchen and blew away the judges with his carefully constructed plates in the tasting challenge. Congratulations are also in order for Corey Hess (26) of Vancouver’s Royal Dinette, who won the title of Le Creuset’s Rising Star and $5000, and Stephen Baidacoff (28), a private chef from Toronto, who was the third place winner and took home $3000. Scholarship founder Chef David Hawksworth engaged the support of food critics and leading chefs from across the country to judge regional heats in Toronto, Calgary, Montreal and Vancouver earlier this spring. Forty competitors, chosen from over 100 applicants, took part in the nationwide competition and eight young chefs were chosen as finalists. The final eight cooked for the title of Hawksworth Young Chef Scholarship winner and the grand prize of $10,000, plus a chance to stage at an international kitchen of their choosing. This dream for Alex Hon was made possible thanks to valued sponsors including Air Canada, Gordon Food Service, San Pellegrino and Le Creuset. Judges Chef Anthony Walsh (Oliver & Bonacini Restaurants), Jackie Ellis (Beaucoup Bakery), Chef Justin Leboe (Model Milk, Pigeon Hole, Model Citizen), Chef Lee Cooper (L’Abbatoir), Chef Normand Laprise (Toque! and Brasserie T) and Chef Scott Jaegar (Pear Tree) were joined by food critics Jacob Richler (Canada’s 100 Best Restaurants) and Sarah Musgrave (Air Canada’s enRoute); alongside Chef Chris Stewart (Hawksworth) and Chef David Hawksworth, to choose the 2016 winner.